KOHAT: Television journalist Hafeezur Rehman was shot dead by unidentified people in Kalo Banda, Kohat on Sunday morning. He was the second journalist in Khyber-Pakhtunkhwa to lose his life in such a grizzly manner in 2015. 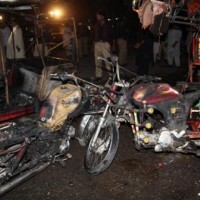 A police official said Rehman was on his bike when he was targeted by the gunmen. “He was hit by three bullets and died on the spot,” said Fazal Naeem, a police spokesman in Kohat. The assailants managed to escape after committing the crime. Kohat police registered a case against unidentified culprits on the complaint of the deceased’s brother Asim Naeem. Rehman was laid to rest in his ancestral graveyard and his funeral prayers were attended by a large number of people. Besides reporting for a private television channel, he also used to run a daily newspaper called Asia. However, financial constraints resulted in the publication winding up about a year ago. The journalist also worked as a correspondent for a national Urdu daily and owned a television cable operating company. Rehman had been a journalist for 12 years. The murder came weeks after a similar attack on print journalist Zaman Mehsud in Tank. Mehsud was also gunned down by unidentified people. Zaman was shot four times: twice in the chest and as many times in the legs. He was admitted to the intensive care unit, but ultimately succumbed to his injuries. The Tribal Union of Journalists in South Waziristan had strongly condemned Zaman’s murder. “It is unfortunate that journalists are either being killed or injured or are forced to leave their homes,“ the union president Shah Zaman had said at the time. Zaman was associated with Daily Ummat Karachi, Nai Baat and was also reporting on Waziristan and its adjacent district, Tank, on his Twitter page @GomalNews. He was once the president of Tribal Union of Journalists in South Waziristan. In addition to working in the field of journalism, Zaman was associated with the Human Rights Commission of Pakistan as its South Waziristan coordinator. He belonged to South Waziristan Agency, but settled with his family in Nursheez village of Gomal in Tank. Since 1992, 19 journalists have been killed in Pakistan but without clear motive, according to the website of the Committee to Protect Journalists, an independent non-profit organisation that promotes press freedom worldwide. The victims include Ijaz Mengal of The Daily Intekhab who was killed on February 14, 2014 in Khuzdar. Also, Haji Abdul Razzaq Baloch of Daily Tawar was killed in 2013 in Karachi, Mehmood Jan Afridi of The Daily Intekhab was murdered on March 1, 2013 in Kalat, Malik Mumtaz of Geo TV and The News International was slain on February 27, 2013 in Miranshah and Aurangzeb Tunio of Kawish Television Network lost his life on May 10, 2012 in Lalu Ranwak. The website states the deaths of at least 56 journalists in the country had established motives; 32 were murdered, 21 were killed while on dangerous assignments and three died in crossfire.